If you are like most people, the kitchen is undoubtedly the busiest room in your home. Whether it be for eating, food preparation, family meetings, telephone conversations, homework, or a quick cup of coffee before you run off to work, there always seems to be something going on in the kitchen. At some time in your life, you will arrive at the decision that you want to partially or fully remodel your kitchen. To most people, it looms as an overwhelming project. There are so many decisions to be made. Here is some practical advice that will hopefully make the process easier. Before you weigh the all important issue of money, consider what your needs are. What is the main use of your kitchen? If you are a culinary artist who loves to prepare meals, think about how to design your kitchen so that you will have the counter space for practicing your craft, easy access to your tools, and a central location for your stove. If you are an individual or family that eats meals together in the kitchen you want to be sure that there is enough room to comfortably sit around a table. Perhaps you use the kitchen to eat, but are not big on cooking. You prefer to eat easy-to-prepare meals that you can pull out of the freezer or cupboard and pop into the microwave. In this case, plenty of storage space is a must. It all boils down to the fact that the kitchen must reflect your lifestyle. Be honest with yourself about who you are. If you are a person who loves to work at keeping your kitchen sparkling clean, then glass, stainless steel, and shiny tiles are suitable for you. But if time or inclination prevents you from making this a high priority, choose materials that require less maintenance, such as blended colors and low gloss surfaces. If you have an active family, you’ll want to be sure that whatever is installed will withstand lots of wear and tear. Extra sturdy cabinet doors and hinges, a heavy duty kitchen table, and easy to clean surfaces are a must. Maybe you want to remodel only a part of your kitchen — right now, replacing the cabinets, changing the counter tops, purchasing a new stove or refrigerator, or redoing the tiling may be all that your plans include. If this is so, you want to make sure that your new items will match what already exists. Remindyourself that at some point, you may want to make other alterations. Don’t lose sight of the big picture. The options and possibilities can boggle your mind. In your city or town, there is surely at least one large kitchen design studio. Pay the studio a visit and you will receive many ideas. For example, you may see a layout that is not completely to your liking, but that still offers ideas; take them! Many magazine racks or libraries have periodicals that deal exclusively with kitchen remodeling. Give yourself time to read a few; they offer a wealth of information. Visit your local home center. Speak with neighbors, family members, and friends who have been down this road. Hear what they have to say. Because there are so many decisions to make, give yourself plenty of time — do not rush into anything. For instance, don’t decide to remodel shortly before the holidays, or just before a major family event. Do not impose upon yourself hard to keep deadlines. Draw up a game plan. Before you hire any contractors, ask for references and go to see the work they have done. Speak with more than one. And make sure that they are properly insured. 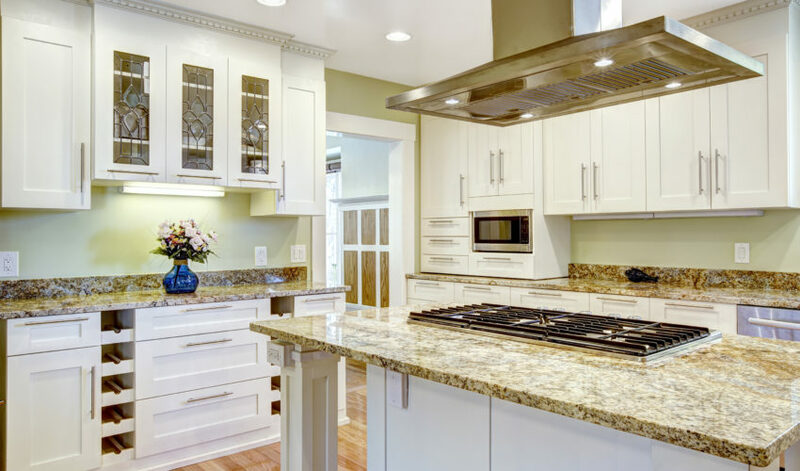 If you are doing a complete kitchen remodel, it may be preferable to work with a kitchen remodeling contractor who will assume responsibility for the entire project. Among the provided services should be a computerized 3D layout of your kitchen plans. Keep in mind that building a new kitchen involves coordination among many trades: the cabinet maker, electrician, plumber, gas company, tile setters, countertop installer, and more. One person overseeing all of these craftsmen is a big plus. While your dream kitchen is being worked on, you may find yourself inconvenienced. It is not uncommon for home owners to find themselves without water or electricity in their kitchens for a period of time. The room may remain a mess, the house a bit dusty. Chances are that you will have to eat some of your meals in the back yard, patio, or the local diner. Schedule delays are not uncommon. Just when everything is going according to plan, an important appliance, fixture, or part will be out of stock. When the contractor is 100% finished with your beautiful new kitchen, there will be no tearful good-byes. But some of the frustration may be eased if you know to expect these setbacks. Kitchen remodeling is not always easy, but if you plan and execute it well, the end product will make it all worthwhile. For most, this is a once-in-a-lifetime venture; so do what is right for you. Don’t let anyone push you into something that you do not want or need. Seek advice, but trust your own judgment. Furthermore, be realistic about your budget limitations. Try to plan ahead and expect the unexpected. As the work proceeds, don’t be surprised to find that you want to make some adjustments; additional purchases may be required; the old stove may no longer fit in with the new design. You know how it can be, you buy a new dress, and then you realize that your old shoes don’t match. Creating a kitchen that reflects your personality and suits your needs can be an exciting and fun-filled experience. It allows you to express your creativity in a way you never imagined. Hopefully, the ideas presented in article will set you in the right direction, and lead to many wonderful years in the busiest room of your home.